Professional and Enterprise users and Reporting Add-on users can create reports of your contacts, companies, deals, and tickets directly from one a custom saved filter. Click All saved filters to choose one of your saved filter or create a new saved filter. Hover over the saved filter you wish to report on and click Options then select Create report. 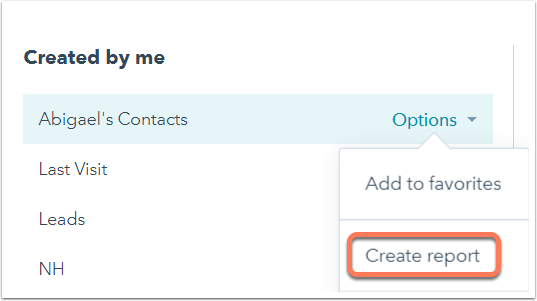 This will bring you to directly to the report builder and automatically includes the contacts, companies, deals, or tickets that are included in your saved filter. Click a chart icon to adjust the data visualization for your report. Click the Data tab to customize any properties and filters included in your report. When you're finished, click Add to dashboard.